If you need the directions and the code to control your Vizio TV using your Dish remote control, here are the instructions you need. 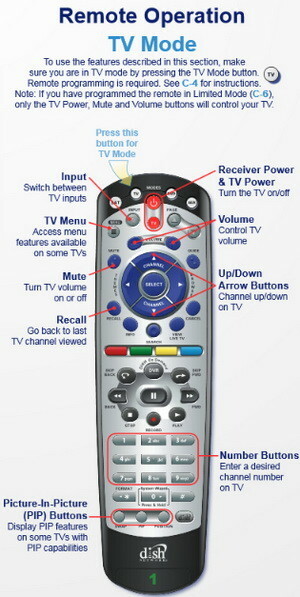 The red TV button on the Dish remote will now turn the TV on, change volume with volume controls, mute, and more. Questions or comments on programming a Dish remote to operate a Vizio TV? Please leave a comment below. Just bought a Vizio V505 G9 tv..what is the code to use on the dish network remote to program the remote? An elderly friend’s tv went out on Thanksgiving morning and he insisted his wife go with him to Walmart to get one before the football games came on! They have satellite tv and he wasn’t happy he had to use two remotes to turn things on and off. I found your information online and was able to text her step by step information to program her Dish remote to turn the Vizio tv on and off and her husband is a happy man once again. Thank you for easy to follow instructions that we women were able to follow with NO PROBLEMS! When I use my on button, my off button and mute button and the aux lights up. They don’t work. When I push the tv button below the button that turns off the receiver, the tv button at the top lights up but it doesn’t turn the tv off. What is the solution to the problem? 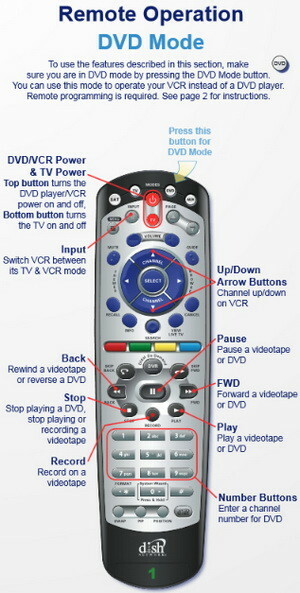 Can you tell us the model number of your remote control that you are using?